Mint state and key date listed Buffalo Nickel values is for graded, certified and authenticated coins in PCGS or NGC holders. The rest are a sample of raw coin sell but this is not a guarantee your coin with the same date, mint, grade and holder will sell for this exact value. 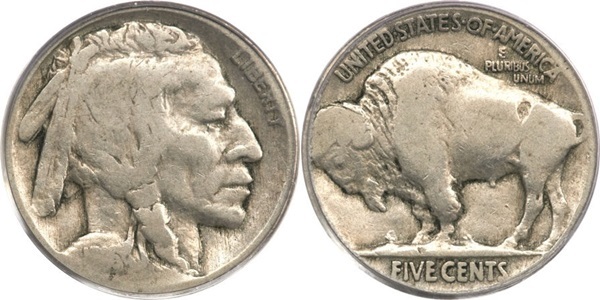 As popular as this coin series is the value for most Buffalo Nickels is .25 cents and up, since most dates are common; and many found have no dates or partial dates. So a Buffalo Nickel value is highest when the coin has a full date and no damage or uncleaned. It seems this series is plagued with coins that have scratches and a scratch will decrease the value. You have two different reverse types for Buffalo Nickels, one is called “On A Mound” Type 1 and “On A Plane” Type 2 with the Type 1 is dated 1913 only and all three mints struck this type. (If you see a no date Buffalo Nickel and the reverse is Type 1 then it’s dated 1913). The 1913-S Type 1 is most rare and value starts at $50. The 1913-S Type 2 is the key date based on mintage alone and value begins at $300. 1913 through 1918 are decent dates even in the lowest grades, and so are D (Denver) and S (San Francisco) mint mark coins from 1919 through 1926, these better dates start their value at $10 to $20 each. The 1921-S is a semi-key date and value starts at $60. Proofs were minted in the years 1913, 1914, 1915, 1916, 1935, 1936, 1937 and a Special Proof dated 1927 with the FIVE CENTS in a recess. Buffalo Nickel value for proofs begins $700 but the 1927 SP is worth $50,0000 and up. As stated before condition is important and coins with full dates, and full horns bring the most premium and obviously key dates rise in value more than common dates as the grade increases. However these coins, of any date, start to become rare in AU (About Uncirculated) and MS (Mint State examples are even more rare. You can’t buy a Buffalo Nickel in MS condition for less than $50 and most go well over $100, and this stands to reason since most Buffalo Nickels are found worn, scratched and with only part of their dates showing. 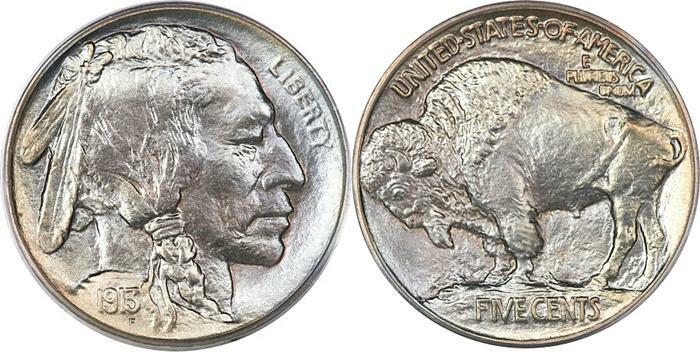 Buffalo Nickels are most famous for their valuable varieties and most notable and well known is the 1937-D Three Leg that’s has a beginning value of $350, but this is not the most valuable Buffalo Nickel variety; the 1916 DDO (Doubled Die Obverse) holds that title with a beginning value of $3,000+, depending on if the coin is certified or not. You also have the 1914/3 Over Date, 1918/7-D Over Date, 1936-D 3 1/2 Legs and a few more minor varieties to look for; I recommend buying the Cherry Picker’s Guide and visiting sites like CONECA to learn different varieties not listed here. Mint mark: None (for Philadelphia) on the reverse below FIVE CENTS. Buffalo Indian Head Nickel value for all dates and mints and varieties.